No other people, organization, or religion, has as much in common with the Jewish people, as do the Mormons. You have been driven, robbed, and ravished – so have we. You have been persecuted mistreated and misunderstood – so have we. Why? We were driven from our homes to desolation beyond the boundaries of the United States. You too have been driven. Why? there may be other reasons, but it can scarcely be denied that conflicting religious opinions have played a major role in such unfortunate and related experiences. There is possibly no other question upon which the children of G-d are as seriously divided, as upon religious matters. Some of the greatest recorded persecutions have been instigated by religious leaders of men. This is very displeasing to G-d. what a power we could be in the world if we were united. The Jewish People will find our message most fascinating. the complete accomplishment of our mutual and heaven-assigned responsibilities involves us becoming united, (As the descendants of Joseph) with the descendants of Judah, (The Jewish people) in the fulfillment of the promises given to Abraham and renewed with Isaac and Jacob, that through them, and their seed, all nations of the earth would be blessed. Therefore Judah, we as descendants of Joseph, a part of the family of Israel, invite you to consider with us some very important matters which affect both of us and our future as promised by the Lord and proclaimed by the holy Prophets. Today the descendants of Judah, who still practice the religion and traditions of Judaism, are often assumed to be the only remaining Israelites. But if we look at the biblical history, and the fate of all twelve tribes we see that ultimately the descendants of Jacob were divided into two kingdoms: The kingdom of Judah, and the kingdom of Israel under the half tribes of Joseph: Ephraim and Manasseh. The Lord inspired the Prophet Ahijah to predict the division of Israel into two kingdoms (Melachim 1 or I Kings,11:31-32) From the days of Jeroboam, to this day, these kingdoms have never been reunited although the Prophets have foretold their ultimate reunion. Together they embrace all the descendents of Jacob. Therefore in looking for the fulfillment of the promises of the Lord to Abraham, Isaac, Jacob, and their descendents we must look not only to Judah. We must realize that great were the promises of G-d to the other descendents of Israel under the leadership of the Ephraim and Manasseh, the two half tribes of Joseph. Of this fact all Jewish and Mormon people need to be made aware because neither without the other can accomplish what the Lord expects, and what He has foretold in the Torah. Jacob called for his sons and said, “Gather and I will tell you what will happen to you at the end of days. Judah, [as for] you, your brothers will acknowledge you. Your hand will be at the nape of your enemies, [and] your father’s sons will prostrate themselves to you. A cub [and] a grown lion is Judah. From the prey, my son, you withdrew. He crouched, rested like a lion, and like a lion, who will rouse him? Father Jacob’s blessings upon his sons were to tell them of what would befall their posterity in the future. It would appear that the blessings given to Judah contemplated the coming of the Messiah, who would gather the people for the last time in preparation for the messianic, or millennial, age. And this is the blessing with which Moses, the man of God, blessed the children of Israel before his departure. . . .
א. וְזֹאת הַבְּרָכָה אֲשֶׁר בֵּרַךְ משֶׁה אִישׁ הָאֱלֹהִים אֶת בְּנֵי יִשְׂרָאֵל לִפְנֵי מוֹתוֹ: . . .
Moses’ description of the land into which Joseph would be separated is most impressive. Moses also goes further and foretells that the Lord will gather the descendents of Joseph from the ends of the earth. He also indicates that the posterity of this branch of the house of Israel was to be large in number. He says there shall be “myriads” of the tribe of Ephraim. If the only members of the house of Israel today were Jewish, where are these “Myriads of Ephraim”? Many are lost among the gentiles and in false gentile religions, but the Lord G-d has promised to bring them back from the ends of the earth and to join them again with Judah. This is happening now. Because Israel was going to be divided into two kingdoms and then both kingdoms were to be scattered among the gentile nations, the Lord made provision that two records should be kept: one by Judah, and one by Joseph. This was foretold by Yechezkel, or Ezekiel, the prophet. The Lord further promised that these two parts of Israel and their records would one day become one. The Tanakh – The Hebrew Bible- contains no record of the tribes of Joseph after 3041. (721 B.C.E.) Where then is the record of the fulfillment of the promises of the Lord to them? The prophecy that two records would be kept was fulfilled. Part of the message of the tribe of Joseph to Judah is that this record has been brought forth. This new record is known as The Book of Mormon, thus called because Mormon is the name of the ancient prophet who complied it. It contains records kept by the descendents of Joseph since they left the land of Israel, and covers a period of approximately a thousand years. From this record we learn that the good land promised to Joseph and all Israel by Jacob and Moses was America. We learn that this land will be a gathering place for the seed of Joseph. We learn also that the Jewish people will be gathered in our time back to the Holy land and rebuild the city of Jerusalem. All of these prophecies were made in plain language long before any of these events took place. Now Israel as a nation is a fact. This makes it clear that the Work of God will be greater than the wisdom and understanding of men. This work of God was to come at a time when the worship of God would be mere tradition for many. Such conditions prevail in the world today, and throughout Israel. Here we must pause to clarify that it is not our intention to put an end to the traditions that have preserved the Jewish people during the long Diaspora, or to denigrate the heritage that has sustained Israel. We do not wish to take away your traditions or your Jewishness. Rather we hope only to give additional insight and perspective to these traditions. Likewise we reject the condescending notion taught by the evangelical Christian churches calling themselves “Messianic Jews” who claim that by accepting Jesus as the Messiah you will become “complete”. We are complete members of Israel regardless of whether we think Jesus fulfilled the Prophecies of the Messiah or not. This should not be the divisive issue it is, so reminiscent of the violent forced conversions of darker ages. Let us instead remind them that Jesus was Jewish, and maybe he would rather convert them to his own faith, then see us leave his Jewish religion, for the gentile religion of Christianity. Mormonism is accepted by neither Christians, nor Judaism, as a part of their religion. It is our belief that it is the restoration and continuation of the Judaism of Jesus, a reminder of the original and pure doctrines revealed by G-d to all his Holy Prophets since time began. Thus it is fully compatible with the Torah, and with the historical, Jewish, Jesus. This is the “Marvelous Work,” and “Wonder” Isaiah Predicted above: That Joseph and Judah would be reunited. Not just by friendship of the people, which we hope will continue, but also by being restored to the Lands of Israel, and America, and also by being restored to the original and pure doctrines and understanding of the ancient patriarchs, and in resorting the record of Joseph with the Record of Judah. When viewed in this expansive way, the prophecies of the Tanakh point to a renewal of ancient Israel both physically, as well as spiritually, and intellectually. A renewal that reaches every aspect of life and faith. This will lead to the Kingdom of God on earth, and the messianic age foretold. The establishment of this messianic kingdom by God is the greatest event of the latter-days, or future time period, described by Daniel. It would start small but will eventually fill the whole earth. We live in these latter-days, the future foretold by Daniel. It is my privilege and honor to announce to you that the God of heaven has begun to set up this kingdom on the earth according to His promise. God has accomplished this by raising up a prophet from the lineage of Joseph, a choice Seer Like unto Moses. We invite the decedents of Judah to share with us every gift and blessing of this Latter-Day Kingdom, and learn of this modern prophet of Israel. The modern prophet, named Joseph Smith was one like Moses who also saw the Lord face to face. 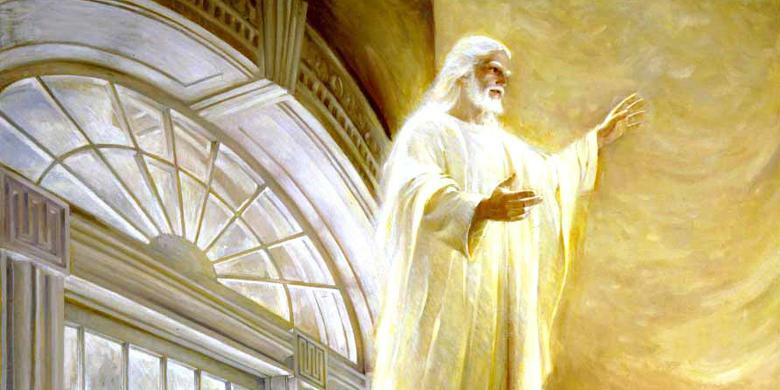 In the spring of 1820 the Lord spoke with Joseph Smith face to face and instructed him that the Latter-day Kingdom of God, and all the prophecies of the ancient prophets concerning the restoration of Israel were about to come to pass. Joseph Smith was subsequently visited by many heavenly messengers to instruct him and give him the necessary authority. This made it possible to revive the ancient priesthood, perform the ordinances of the ancient temple, and many other blessings. These are the things we want you to know about, and hope that you will share these blessings with us. 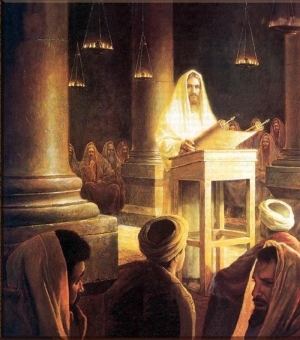 Because Elijah came on Passover/Pesach in 1836/5596, and taught the prophet the promises made to the fathers, we understand more of the purposes of the ancient Temple. Today we build Temples where holy ordinances are performed linking us to our ancestors. This means that ancient Israel and modern Israel are also being brought together. We perform these holy ceremonies not only for the living but also the dead, thus fulfilling the promise of Malachi that our hearts would be turned back to our fathers. The passage also indicates that if it were not for Elijah coming to turn our hearts to our fathers, and our deceased fathers turning their hearts to us today, that the entire earth would be smitten with utter destruction. What an important event! Would you like to enter the temple and reach out to your own ancestors? we invite you to come and partake of these blessings with us. This is but one of many prophecies indicating that the kingdom of Israel under Ephraim, and Judah, would separately gather, and then eventually be united. It is my belief that complete unification will not happen until the messiah appears, but it is my hope that until that time that we can build a friendship that will serve us both in our common goals. 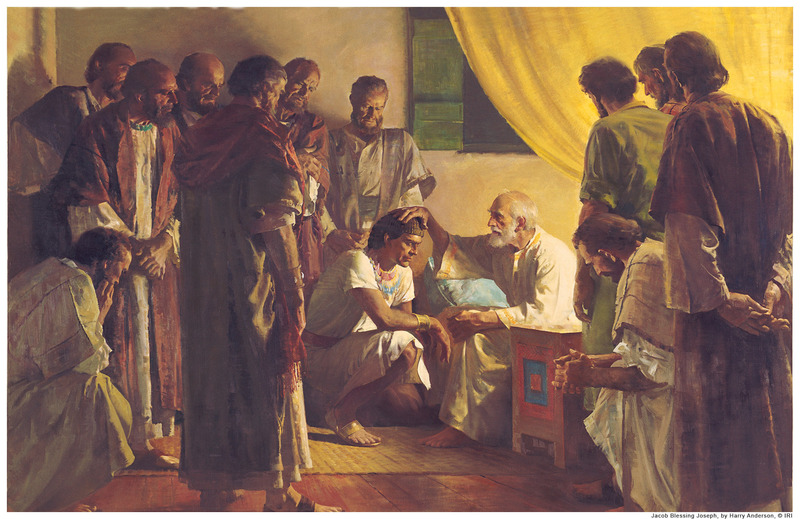 Following these angelic visits the prophet Moshe also appeared to Joseph Smith in the new Temple, and gave him the keys, meaning the knowledge and authority, to gather Israel in modern times, just as Moshe gathered us out of Egypt. 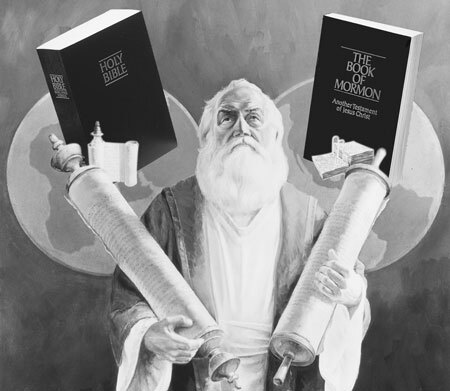 Joseph Smith then became in our day, as Moshe was in his day: the lawgiver to Israel. 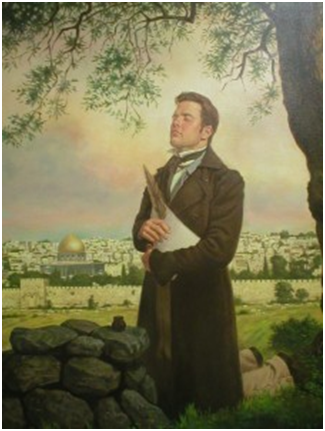 Accordingly he sent Orson Hyde, a Man of Jewish heritage, to rededicate Jerusalem for the return of Israel. This prophet predicted the Zionist movement and the establishment of the state of Israel. This mission set in motion events helped lead to the establishment of the state of Israel. There are many other equally important prophecies which have been fulfilled, and many which await fulfillment. Only by the bringing together of the whole house of Israel, the Mormon and Jewish people, can these prophecies find fulfillment. Therefore we say unto our brothers and sisters, the Jewish people, Come let us reason together, and happily discover our common objectives. We may discover that neither Joseph can say to Judah, nor Judah to Joseph: “I have no need of thee.” For we are one family, we share a common past, and future. “O Thou! who art from everlasting to everlasting, eternally and unchangeably the same, even the G-d who rules in the heavens above, and controls the destinies of men on the earth, wilt Thou not condescend, through thine infinite goodness and royal favor, to listen to the prayer of Thy servant which he this day offers up unto Thee. “Be pleased, O Lord, to forgive all the follies, weaknesses, vanities, and sins of Thy servant, and strengthen him to resist all future temptations. Give him prudence and discernment that he may avoid the evil, and a heart to choose the good; give him fortitude to bear up under trying and adverse circumstances, and grace to endure all things for Thy name’s sake, until the end shall come, when all Israel shall rest in peace. “Now, O Lord! Thy servant has been obedient to the heavenly vision which Thou gavest him in his native land; and under the shadow of Thine outstretched arm, he has safely arrived in this place to dedicate and consecrate this land unto Thee, for the gathering together of Judah’s scattered remnants, according to the predictions of the holy Prophets — for the building up of Jerusalem again after it has been trodden down by the Gentiles so long, and for rearing a Temple in honor of Thy name. Everlasting thanks be ascribed unto Thee, O Father, Lord of heaven and earth, that Thou hast preserved Thy servant from the dangers of the seas, and from the plague and pestilence which have caused the land to mourn. The violence of man has also been restrained, and Thy providential care by night and by day has been exercised over Thine unworthy servant. Accept, therefore, O Lord, the tribute of a grateful heart for all past favors, and be pleased to continue Thy kindness and mercy towards a needy worm of the dust. “O Thou, Who didst covenant with Abraham, Thy friend, and who didst renew that covenant with Isaac, and confirm the same with Jacob with an oath, that Thou wouldst not only give them this land for an everlasting inheritance, but that Thou wouldst also remember their seed forever. Abraham, Isaac, and Jacob have long since closed their eyes in death, and made the grave their mansion. Their children are scattered and dispersed abroad among the nations of the Gentiles like sheep that have no shepherd, and are still looking forward for the fulfillment of those promises which Thou didst make concerning them; and even this land, which once poured forth nature’s richest bounty, and flowed, as it were, with milk and honey, has, to a certain extent, been smitten with barrenness and sterility. “Grant, therefore, O Lord, in the name of Thy well-beloved Son, Jesus Christ, to remove the barrenness and sterility of this land, and let springs of living water break forth to water its thirsty soil. Let the vine and olive produce in their strength, and the fig-tree bloom and flourish. Let the land become abundantly fruitful when possessed by its rightful heirs; let it again flow with plenty to feed the returning prodigals who come home with a spirit of grace and supplication; upon it let the clouds distil virtue and richness, and let the fields smile with plenty. Let the flocks and the herds greatly increase and multiply upon the mountains and the hills; and let Thy great kindness conquer and subdue the unbelief of Thy people. Do Thou take from them their stony heart, and give them a heart of flesh; and may the Sun of Thy favor dispel the cold mists of darkness which have beclouded their atmosphere. Incline them to gather in upon this land according to Thy word. Let them come like clouds and like doves to their windows. Let the large ships of the nations bring them from the distant isles; and let kings become their nursing fathers, and queens with motherly fondness wipe the tear of sorrow from their eye. “Thou, O Lord, did once move upon the heart of Cyrus to show favor unto Jerusalem and her children. Do Thou now also be pleased to inspire the hearts of kings and the powers of the earth to look with a friendly eye towards this place, and with a desire to see Thy righteous purposes executed in relation thereto. Let them know that it is Thy good pleasure to restore the kingdom unto Israel — raise up Jerusalem as its capital, and constitute her people a distinct nation and government, with David Thy servant, even a descendant from the loins of ancient David to be their king. “Let that nation or that people who shall take an active part in behalf of Abraham’s children, and in the raising up of Jerusalem, find favor in Thy sight. Let not their enemies prevail against them, neither let pestilence or famine overcome them, but let the glory of Israel overshadow them, and the power of the Highest protect them; while that nation or kingdom that will not serve Thee in this glorious work must perish, according to Thy word — Yea, those nations shall be utterly wasted. “Though Thy servant is now far from his home, and from the land bedewed with his earliest tear, yet he remembers, O Lord, his friends who are there, and family, whom for Thy sake he has left. Though poverty and privation be our earthly lot, yet ah! do Thou richly endow us with an inheritance where moth and rust do not corrupt, and where thieves do not break through and steal. “The hands that have fed, clothed, or shown favor unto the family of Thy servant in his absence, or that shall hereafter do so, let them not lose their reward, but let a special blessing rest upon them, and in Thy kingdom let them have an inheritance when Thou shalt come to be glorified in this society. “O my Father in heaven! Baruch atah Adonai elohaynu melech ha’olam! I now ask Thee to remember Zion, with all her Stakes, and with all her assemblies. She has been grievously afflicted and smitten; she has mourned; she has wept; her enemies have triumphed, and have said, `Ah, where is thy G-d?’ Her Priests and Prophets have groaned in chains and fetters within the gloomy walls of prisons, while many were slain, and now sleep in the arms of death. How long, O Lord, shall iniquity triumph, and sin go unpunished? “Do Thou arise in the majesty of Thy strength, and make bare Thine arm in behalf of Thy people. Redress their wrongs, and turn their sorrow into joy. Pour the spirit of light and knowledge, grace and wisdom, into the hearts of her Prophets, and clothe her Priests with salvation. Let light and knowledge march forth through the empire of darkness, and may the honest in heart flow to their standard, and join in the march to go forth to meet the Bridegroom. Breishit bara Elohim et haShamayim v’et ha’Aretz. 1 verse, 7 words, 28 letters, and 20 vowels. started from the moment G-d began to create. because the place of this misunderstanding isn’t big. or even in a letter. in the first book of the Torah. In beginning, G-d created the heavens and the earth. “The” is not a lot to miss – or is it? to a moment in space or time. long before chapter 1, verse 1 that is. until arriving at this world we know. So what then about an end? Because the ending is just like the beginning. next page? There is more. spiraling on top of themselves each and every year. Everything is a second chance. May we always remember these words when faced with new ideas, new teachings and new opportunities. We are not asking you to abandon the truths and traditions you have learned, but to add more light more knowledge, and more understanding to the traditions you already have. No matter how perfect, no matter how complete the Torah is that G-d gave us on Sinai, let us open our minds and set our sights to use the revealed torah of G-d to progress forward, not to reject further truths, but to make additional traditions, and progress as we were intended by G-d to progress. If G-d is not standing still, neither should we. Elder Legrand Richards wrote an essay titled “the Mormon and Jewish People” This essay follows many of the same points and was based on his original essay. In other words what will happen to your descendants: the Mormon and Jewish people. i.e. the descendants of Israel, both of Judah and of other tribes shall be called Jews. Tagged Gathering Israel, Israel, Judaism, mormonismBookmark the permalink.